The last road is still a long one, another month of travel ahead and no guarantee of every truly being "home." 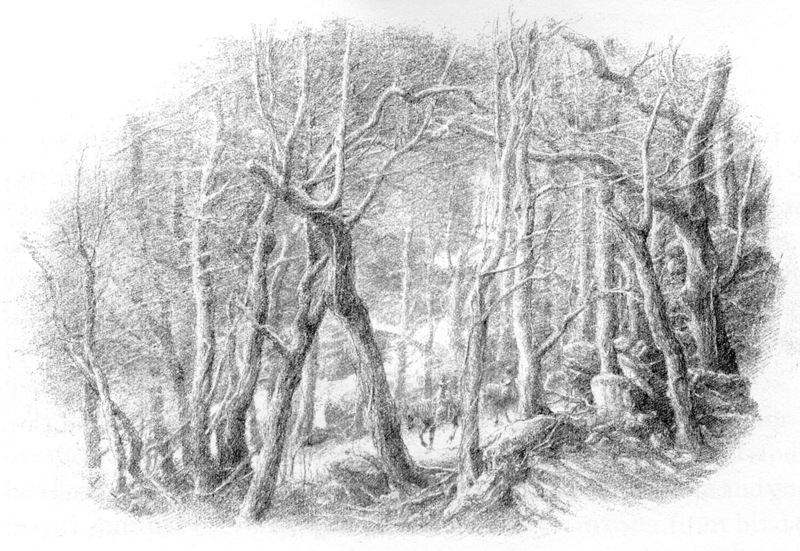 The buried gold from the troll warren is unearthed, and while Bilbo offers it all to Gandalf, it does offset some of the sacrificed share of the gold. I can't help but wonder if Bilbo remembered the gold when he offered his share up to the people of Laketown in an effort to avoid a war? Bilbo commemorates his return to Hobbiton with a song, celebrating the joy of homecoming mixed with the longing of the road. We've known all along that he's considered himself a bit of a poet, but this is the first fully matured expression that we've seen. After so long gone, Bilbo returns home to find he's presumed dead. After all, what respectable hobbit would go adventuring? So of course the ever-practical hobbits have done the sensible thing, and begun auctioning off his belongings and opening up Bag End for it's new owners. Which makes the arrival of the presumed deceased Mr. Baggins in the middle of said auction a bit of an upset and bother. Thank goodness for everything Bilbo picked up on his adventures, it takes a bit of determination and backbone to force half off your property, fight to reclaim your belongings, and spend years of legal bother to sort everything out. The gold he brought back helped a bit too, with having to buy back some of his own furniture. Bilbo is finally home, but it's never home as he knew it before. He's lost the respect of his community, but is content and happy with his life. Bag End is more filled with music, joy, poetry, and visitors than ever before. 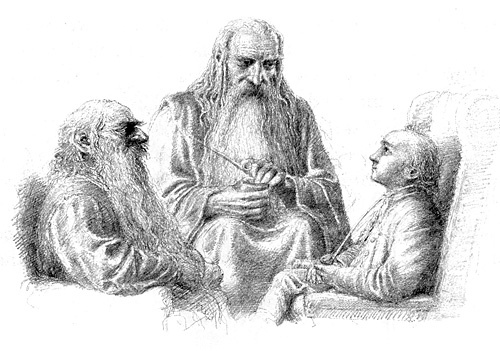 Bilbo remains an elf friend, and hosts rather distinguished visitors including dwarfs, elves, and a certain wizard. "Of course!" said Gandalf. "And why should not they prove true? Surely you don't disbelieve the prophecies, because you had a hand in bringing them about yourself? You don't really suppose, do you, that all your adventures and escapes were managed by mere luck, just for your sole benefit? You are a very fine fellow, Mr. Baggins, and I am very fond of you; but you are only quite a little felllow in a wide world after all!" In the film a rather shaggy looking Bilbo bids farewell to Gandalf and returns to Hobbiton, only to find people walking off with his furniture. It's a beautifully done, with the confusion and disbelief of Mr. Baggins' return, the mixture of elation and dissappointment, and the less than cordial relations between Bilbo and Lobelia Sackville-Baggins (and the Spoons). The legal hassle of being reconfirmed alive is largely hand-waved in a very elegant way, with his employment contract and a final farewell to Thorin. 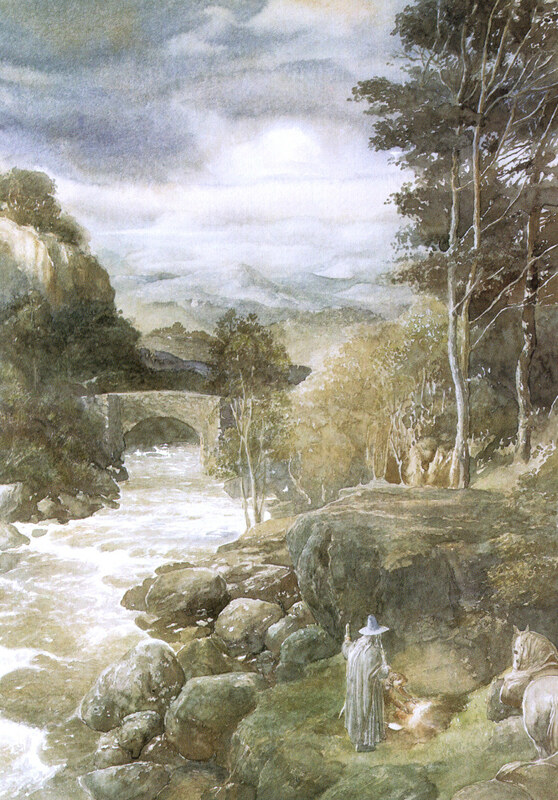 We've lost the return stop at Rivendell, but we already know about a council of wizards, even if it's one of a less cooperative nature than the books imply, and we know about the fighting of the Necromancer. With the changes to the music and overall feeling of the elves of Rivendell (from joyously full of life to proud and aloof), the homecoming visit wouldn't have fit in regardless. But the final homecoming, once he's chased away all the auctioneers and buyers, before he's bothered fighting for his belongings, is very touching. It doesn't matter that his home is ransacked, it's home, and there's even one of his long wished for handkerchiefs waiting for him. This whole section is really well done, Jackson ending the story on a note that resonates strongly in terms of nostalgia and empathy. Of course, since this is in many ways building to Lord of the Rings, we discover that Bilbo does still have that ring in his pockets, with more foreboding than simply a trinket he uses to escape unwanted visitors. Then we're back to the "present" with the preparations for Biblo's birthday party and the events that kick off Fellowship of the Ring. Some final thoughts. This movie has a lot of flaws, things that are extremely frustrating and overwrought. But on the same time there are so many really gorgeous moments that hit exactly where they should. The casting was by and large impeccable, the artistry breathtaking. When I sit and think about the film the things that I recall are by and large the things they got so right, the moments that match the story that I hold dear. When I actually sit and watch it I find those memories are a bit biased, with large holes of filler that fails to hold my attention and bits that were actually a bit more distorted than remembered. It is a lovely movie, and a well meant tribute to a piece of literature that many of us hold very dear to our hearts. It's not perfect, but chances are we're never going to get the perfect Hobbit film. So on Tolkien's birthday we wrap up this stage of the journey, and prepare to embark on a even longer one with the group read of The Lord of the Rings trilogy. Further discussion of the various media and materials can be found at our group on BookLikes: Simarillion Blues, come join us!